Continuing upstream along the Allegheny River we come to Herr's Island and the 31st Street Bridge. It is another 3 span arch, but with the arches below the deck. The main span is 360 ft (110 m) long and the side spans are 180 ft (55 m) in length. The bridge has long approaches on both sides of the river for a total length of 2681 ft (816.5 m). It looks like they are replacing the deck. The decks of Pittsburgh's bridges must get a workout due to freezing winters and heavy truck traffic, especially when the city was a center of industry. This bridge was built in 1927, which means its 82 years old. It's relatively straightforward to replace the deck of an open spandrel arch bridge, but it may be impossible to replace the deck of a through arch, because the deck is in tension. 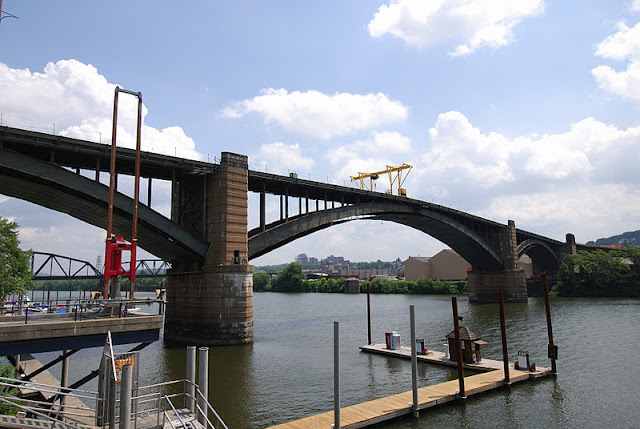 I wish I had continued upstream to photograph the equally handsome Washington Crossing Bridge, but you can get more information on both bridges at http://pghbridges.com/. Pittsburgh Bridges: 31st Street Bridge by Mark Yashinsky is licensed under a Creative Commons Attribution-NonCommercial-ShareAlike 3.0 United States License.